Coolbeg has its own 19 foot traditional lake boat for hire with or without engine. 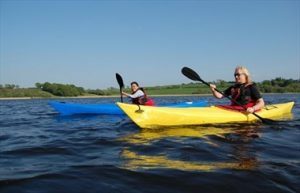 Day boats are also available for hire from other Upper Lough Erne locations at Knockninny Marina and Castle Crom.On lower Lough Erne, Castle Archdale Marina have larger eight person day boats for hire and also offers a full range of day watersports activities. Closer at Share Holiday Village, 8 miles away, kayaking, banana boating, windsurfing and dinghy sailing are all available with tuition if required. Lough Erne offers the ultimate adrenaline water sports venue. Several times holding wakeboard and water skiing world cup championships. For water skiing lessons contact richard@ultimatewatersports.org.uk, by phone at 07808736818 or by Share Centre. 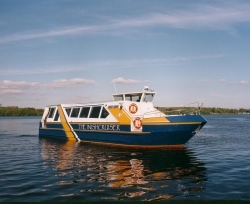 Erne Tours, based at Enniskillen, offer 1 and ¾ hrs, 58 seat guided tours on the M.V. Kestrel water to the Devenish Island Monastic site. The Inish Cruiser located at Share Centre Lisnaskea offers tours up to the ruins of Old Crom Castle and return.